Purple Shamrock grows in a clump habit of striking purple foliage. Its triangular-shaped leaves fold along the vein and look like butterflies fluttering above slender stems. Many varieties are available, including 'Triangularis' pictured here. Other common names for this plant are False Shamrock and Shamrock Plant. You can expect an abundance of soft-pink flowers to appear in spring and summer. Dainty, five-petaled blooms rise like trumpets above the mounds of purple, clover-like leaves. Don't let its fragile appearance deceive you. This is one of the easiest flowering house plants to grow as long as you can keep it moist and shaded. 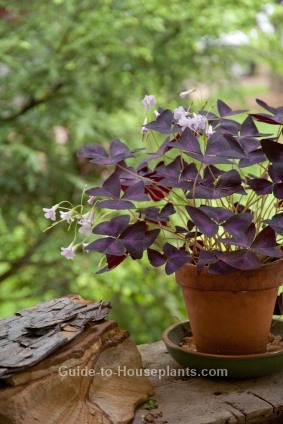 Oxalis plants may go dormant if the soil is allowed to dry out or if it's exposed to hot, direct sun. Don't worry, it will come back. Just cut off all the leaves and you'll have a healthy, thriving plant in just a few weeks. Divide this plant or repot it anytime. Use a pot with drainage holes to prevent soggy soil. If you want to use a decorative pot without drainage holes, use it as a cachepot. Just slip a plain nursery pot into the cachepot. I put pebbles in the bottom of cachepots to keep the plant above the drainage water. This happy-go-lucky plant seems content to be anywhere. 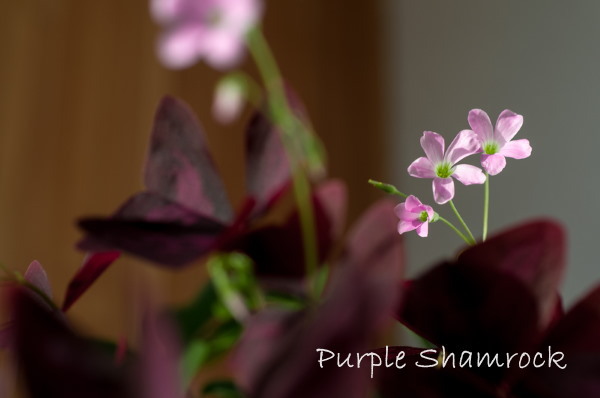 You can grow Purple Shamrock indoors year-round, or move it outside on a shady patio for the summer. It can be planted outdoors in frost-free regions, but it's fast-spreading and can be invasive in the garden. Light: Bright indirect light will give O. regnellii the best leaf color. Leggy, spindly growth is often caused by lack of light. Move the plant to a spot where it will get curtain-filtered light from a south-facing window. Water: Allow surface of soil to dry between waterings. Don't allow the potting medium to dry out. 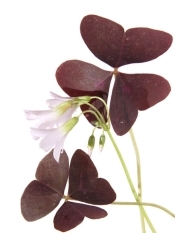 Oxalis is sensitive to the salt buildup from fertilizers. You'll notice it as whitish deposits on the surface of the soil or around the rim of the planter. It's a good idea to flush the soil occasionally to rid the soil of excess salts, which can harm this plant's fleshy roots. Flush the pot every month or two by watering plants thoroughly with room-temperate water. Allow the water to drain through the drainage holes for a half-hour. Then flush it again. Empty the drainage tray afterward so that the plant is not sitting in water. Humidity: This Brazilian native prefers relative humidity around 50% or higher. If indoor air is dry, try one of these easy ways to increase humidity for your plant. Temperature: Prefers cool temperatures, especially while in bloom; 55-65°F/13-18°C at night/not warmer than 75°F/24°C during the day. Propagation: Divide the plant by gently pulling apart its small, tuberous roots into smaller clumps and potting them in separate containers.